Marvel Studios unleashed an Asia-wide promotional blitz for their latest superhero blockbuster in Seoul on Monday, with a triumvirate of stars as well as the head of the studios going all out to woo their primary market. 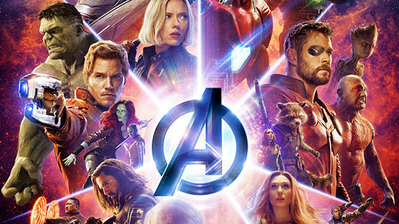 Robert Downey Jr., Brie Larson, and Jeremy Renner, the stars "Avengers: Endgame" were accompanied by Marvel Studios chief Kevin Feige, executive producer Trinh Tran, and directors Joe and Anthony Russo and drew over 400 reporters from Korea and 11 other countries in the region. Downey, who reprises his role as Iron Man for the umpteenth time, warmed up the atmosphere with improvised dance moves. He said being part of the Marvel superhero series in the past 10 years provided him with "life-changing experiences," and that he is "glad to be part of witnessing this cultural moment that's coming up." The most life-changing of these will have been his astronomical fees. 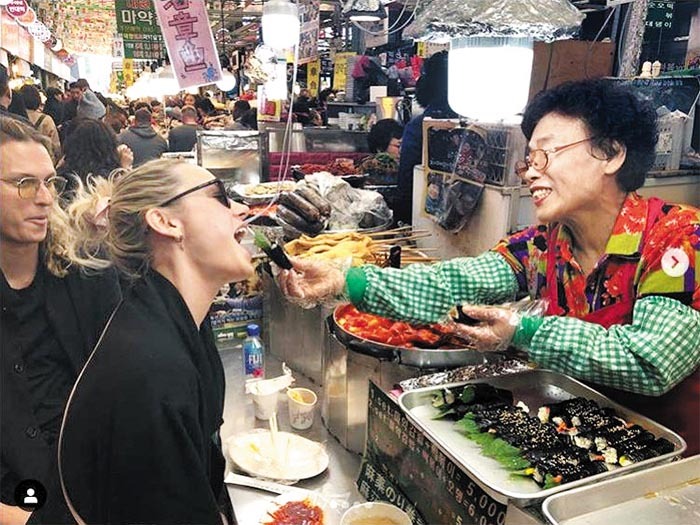 Hollywood actress Brie Larson tries gimbap or rice rolls in a market in Seoul on Saturday in this photo from her Instagram account. Larson, who plays Carol Danvers, the studio's first female superhero in "Captain Marvel" released here last month, said the film "totally changed the way I carried myself and it strengthened my voice." "I think [Danvers] is the symbolism representing the importance of representation, the importance of female stories and the female journey. It's about equality at the end of the day," she added dutifully. Renner, who plays Hawkeye, was equally on-message. "I just love that people are really that invested in the emotions and the characters in the decade of the movies that have come out," he gushed. "I am proud of being part of it." The three stars blogged their sightseeing experiences on social media. Larson posted a picture of being fed gimbap or rice rolls in an open-air market and wrote, "I'm a street food fan. I love it." Renner put up a number of photos from his trip to Gyeongbok Palace, and praised soju. "Avengers: Endgame" piles in everything it can from the 22 films in the franchise since "Iron Man" in 2008. The Marvel series have attracted over 28.7 million viewers in Korea over the last seven years.